Devendra Jhajharia bettered his own world record to win gold in the men's javelin throw event at the Rio Paralympics. He had previously won the gold in javelin at the 2004 Athens Paralympics with a record throw of 62.15 metres. He improved upon it with an attempt of 63.97 metres at Rio. The 36-year-old is currently ranked third in the world. The Rajasthan born athlete, with an amputated left hand, was awarded the Arjuna award in 2004 and the Padma Shri in 2012, becoming the first Paralympian to receive the honour. Devendra has taken India's medal tally to four medals - two golds, one silver and a bronze. Prime Minister Narendra Modi congratulated Devendra on his feat. In a tweet, the PM said that the country is very proud of him. Devendra Jhajharia (born 10 June 1981) is an Indian Paralympic javelin thrower competing in F46 events. 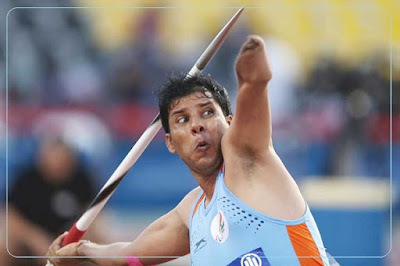 The first Indian Paralympian to win two gold medals at the Paralympics, he won his first gold in the javelin throw at the 2004 Summer Paralympics in Athens, becoming only the second gold medalist at the Paralympics for his country. At the 2016 Summer Paralympics in Rio de Janeiro, he won a second gold medal in the same event, bettering his previous record. Devendra is currently being supported by the GoSports Foundation through the Para Champions Programme.